If you have any questions about your tattoo or the healing process, please text me, call the shop, or e-mail. ::Always wash your hands before touching your tattoo! ::Take the bandage off the following morning of the tattoo or after 2 to 3 hours. ::Wash your tattoo with an Cetaphil Gentle Skin Cleanser preferably, and if not anti-bacterial liquid soap. Be gentle, do not use a washcloth or anything that will exfoliate your tattoo. Only use your hands. ::Gently pat your tattoo dry with a clean cloth or paper towel. Do not rub, or use a fabric with a rough surface. ::The first 3-4 days: Rub a small amount of ointment on your tattoo. You may use Aquaphore, Coco butter, any tattoo aftercare (tat wax, Hustle butter, ect..) or panthonol cream – whatever you know you’re not allergic to. Always use clean hands and do not place your fingers back into the ointment after touching your tattoo. ::Make sure to rub the ointment in so that it is not shiny, or greasy– you want the thinnest amount possible. ::Pat off any excess ointment with a clean cloth or paper towel. Do not use Vaseline, petroleum or Bag Balm. ::Wash, dry and apply ointment 3-5 times daily, as needed. ::On the first night, you may want to wrap your tattoo in saran wrap to prevent sticking to your bedding. Do not use any cloth bandages or pads, as the fibers of this material can adhere to your open tattoo and hinder the healing process. ::Wear clean, soft clothing over your tattoo for the first 2 weeks– nothing abrasive or irritating. For a foot tattoo: go barefoot as much as possible. If you must wear shoes, first wrap your clean tattoo in saran wrap, then cover with a clean cotton sock before putting on your shoe. Avoid sandals or flip flops for this period to prevent chafing and damage to the tattoo. ::After day 4: On the 3rd or 4th day your tattoo will begin to peel. This is normal! Do not pick at the skin. Begin using a mild, white, unscented lotion, free of dyes or Perfumes. ::Use lotion for minimum 2 weeks, 1-2 times daily. ::Do not pick, scratch, peel, slap, rub or irritate your tattoo. ::You can shower, but you may not soak your tattoo for 2 weeks. No swimming, soaking or hot tub. ::You may not expose your tattoo to the sun for at least 3 weeks, after that you must use sun block. ::Do not wear abrasive materials, jewelry, or shoes that rub against your tattoo. Tatu-derm is a hypo-allergenic, self-adhesive bandage. It allows your skin to breathe, but protects it from the environment. Because of this it is safe to keep Tatu-Derm on for 3-5 days, but if it is bothering you remove it and follow the regular aftercare instructions. When the tattoo feels closed—dry and less sensitive—then you should remove the bandage. It may fill up with plasma & ink and create a black liquid trapped in the bandage, that is normal. If it starts to leak remove bandage and continue with regular aftercare instructions.
? Skin feels irritated by the bandage itself. It is uncommon, but some people may be sensitive to Tatu-Derm. The tattoo will be itchy and the bandage may be an annoyance, but if you see a rash forming under the bandage or it feels painful, remove the bandage right away.
? The tattoo becomes exposed to the air. If the seal is compromised remove bandage immediately. Remove Tatu-Derm carefully. Peel the Tatu-Derm back gently from the edge. Warm, soapy water will help break down the adhesive. It may be helpful to pull the bandage straight out to stretch and release the adhesive. After removing bandage clean adhesive from area gently but thoroughly. If any sticky residue is left over it can be removed with lotion. The tattoo should be mostly healed, but some areas may still be in the initial stages. Pick up with normal aftercare. Lotion for the next two weeks and keep it clean. :Haley has dedicated her soul to tattooing since the age of 15. She started her apprenticeship at a shop based in IL. Owned her first shop in NC at the age of 19, she moved to AZ from NC to further feed her addiction of constantly developing her knowledge and skill in tattoos to the highest level. She has a wildly original style which includes realism and something far from; anything interesting, colorful, unique, and custom. Realism Tattoos San Francisco. 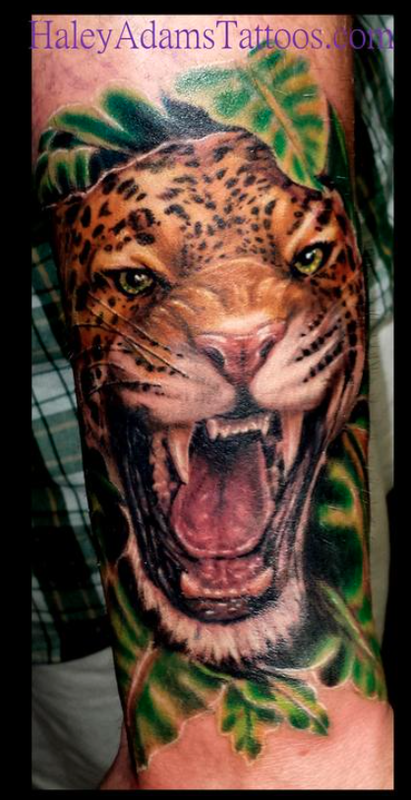 Realistic tattoos san francisco, color tattoo artist san francisco. ∑ Jeff Gogue - "Tattooing as I see it"